They say he’s a little crazy. He’s willful, he goes for his goals without regard to time and material benefit. But unlike his fellow dissidents, he doesn’t sit in a comfortable chair in some office. He writes articles, organizes conferences, designs kitchens, and presides over the Šalamoun association. But above all, John Bok (59) is a man who can’t stand vice in any form, and his life’s goal is to defeat it. JOHN BOK was anathema to the communists. An English mother, and his father an RAF pilot in WWII, the family was permanently tailed by State Security, and in 1970 Bok’s passport was taken away. He wanted to direct films, but he wasn’t accepted by FAMU because they said he wouldn’t return the value society invested in him. He signed Charter 77, and like many others he worked at many menial jobs during the “normalization“. After the Velvet Revolution, when dissidents held interesting positions, Bok again distinguished himself. He was Václav Havel’s first bodyguard, but he could stand working for the Constitution and Democracy Protection Authority, FBIS, for only three years. He repeatedly had tough run-ins with former StB agents and nomenclature members. “I was like an infection they needed to get rid of, so they cast me out,“ he recalls, adding that because of his intrinsic need for transparency and hatred for “comradely“ fraternization, he never lasted long in any position. In 1993, when his skepticism peaked, he was a public restroom cleaner. Since 1994 he has chaired the Šalamoun association – an organization that supports independent justice in the Czech Republic, whose goal is to assist victims of court proceedings and investigations in which doubt arises as to their independence. “It’s arduous, Sisyphean work. We are able to help only a small percentage, and it always depresses me,“ he complains. Like dozens of other volunteers, Bok does this work for free. 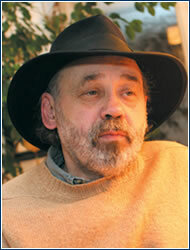 It seems that this eternal rebel’s greatest hobby is battles that are already lost – on 27 September 2004 he ended a thirty-day hunger strike against Stanislav Gross’s policies, prior to starvation. His run for the Senate on Balbín’s Poetic Party slate likewise failed. Nevertheless, when he vows in closing that he’d rather be shot by terrorists than lose his freedom, you believe every word.